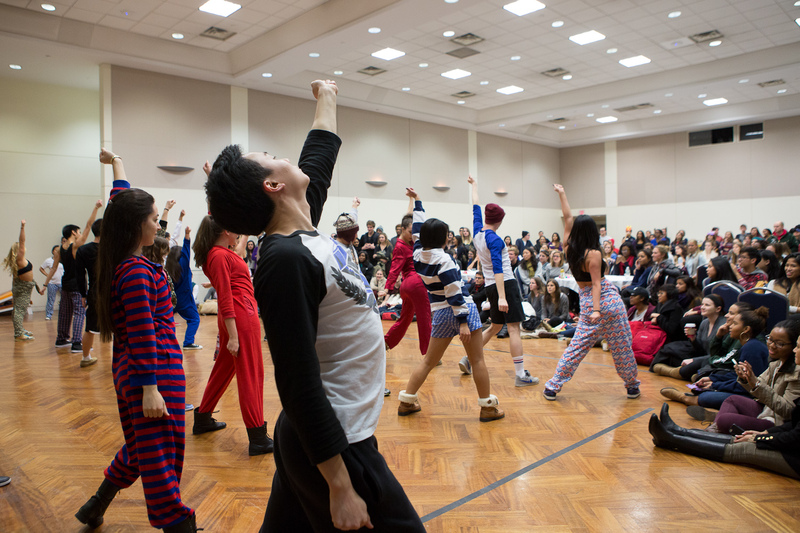 This year’s dinosaur-themed event, “The Land Before Finals,” offered games, giveaways and more. Howard Davis, director of advising and administrative records in the School of Engineering and Applied Science, and Vice Provost and Dean of Student Affairs Peter Konwerski serve breakfast to students. Senior Betsy Awelachew counted off which finals she had left on her fingers: one for peace studies, one for her race and minority relations class and the one making her most nervous: neuropsychology. The psychology and pre-med major said she’ll be hunkered down every day this week as she dives into study materials—but Monday’s Midnight Breakfast offered her a respite before cracking the books. “It lets you take your mind off stress and just relax for a night,” she said. 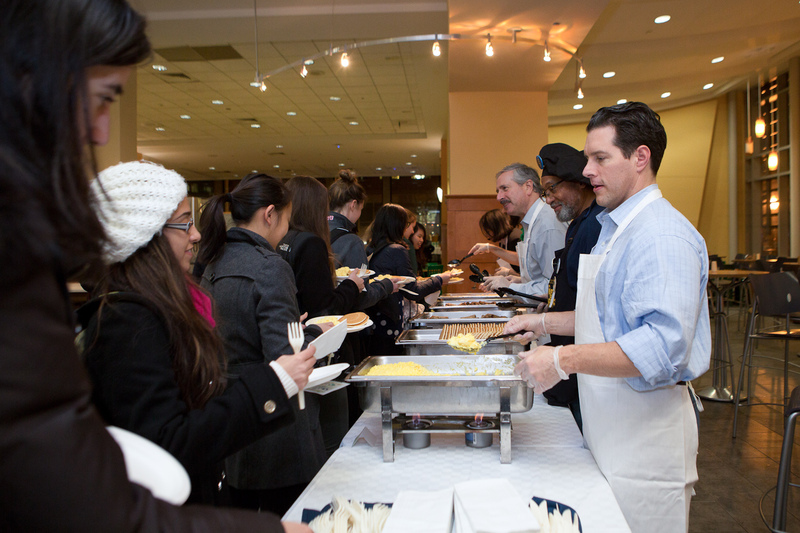 Midnight Breakfast, now in its 28th year, is a tradition at the George Washington University. 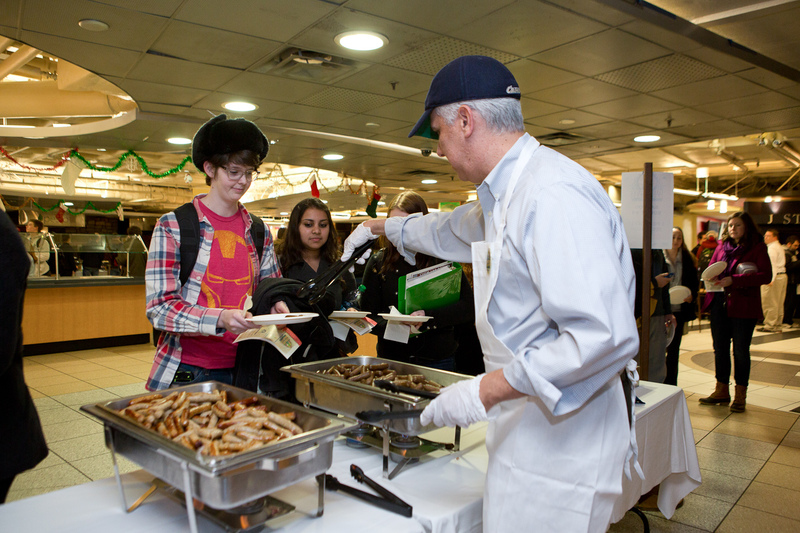 Faculty, staff and students volunteer to serve breakfast and organize activities to give students a much-needed study break during finals. 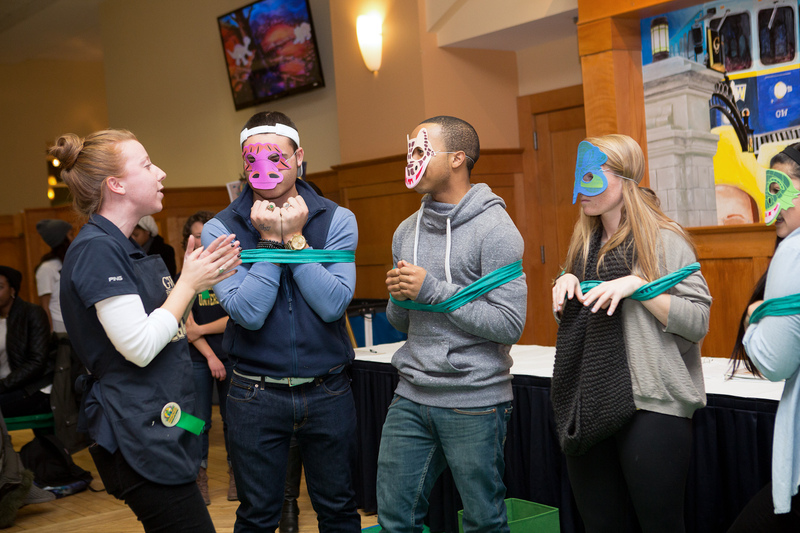 The Division of Student Affairs organized this year’s dinosaur-themed “Midnight Breakfast: The Land Before Finals” with co-sponsors Campus Dining, Colonial Ambassadors, GWise, GW Program Board, the GW Bookstore and WRGW Radio Station. “Our students are working tirelessly to study for finals. Midnight Breakfast provides them an opportunity to relax and re-energize,” said Jovanni Mahonez, coordinator for administration and hallmark programs. At 10 p.m. on Monday, lines snaked down the Marvin Center as approximately 1,800 students gathered for food, games and giveaways. Associate Provost for Diversity and Inclusion Helen Cannaday helps out at Midnight Breakfast. Senior Associate Provost and Dean of Student Affairs Peter Konwerski serves breakfast. 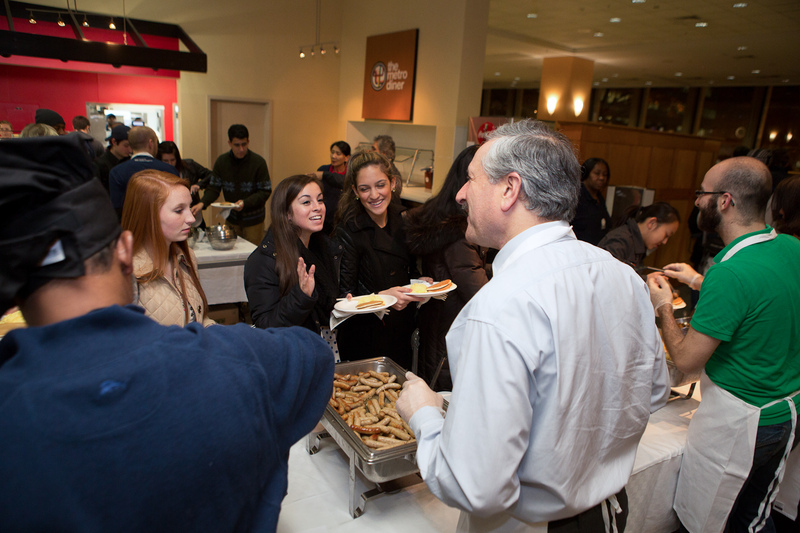 Provost Steven Lerman serves breakfast to students. 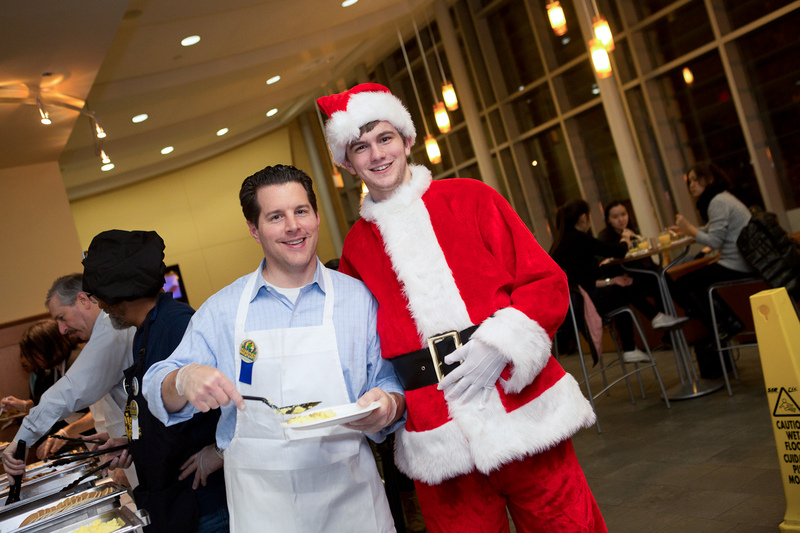 Senior Associate Dean of Students Mark Levine volunteers at Midnight Breakfast. Associate Dean of Students Tim Miller serves breakfast. Senior Associate Provost and Dean of Student Affairs Peter Konwerski and a student volunteer. Students are briefed on the rules for the T-Rex Race. Students compete in the T-Rex Race. Provost Steven Lerman announces the winners of the T-Rex Race. The Gelman Library staff sets up a dinosaur-themed photo booth. Senior and winner of Battle of the Voices Lillian Dawit performs. In the Metro Diner, Provost Steven Lerman and Vice Provost and Dean of Student Affairs Peter Konwerski helped Howard Davis, director of advising and administrative records in the School of Engineering and Applied Science, and other faculty and staff members serve pancakes, sausage, eggs and more. Mr. Davis stood over a tray of steaming food and showed off pins he’s received for volunteering at past Midnight Breakfasts—he’s been lending a hand at the event for more than 10 years. “I know many of our students, and it’s a joy to see them come through here because I know they’re studying hard. I feel like this event is a good way to give back and show that we are behind them,” he said. 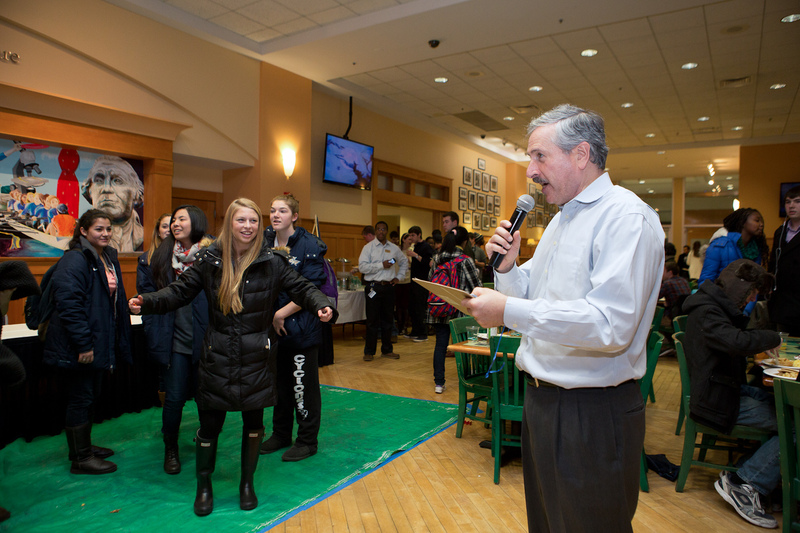 Dr. Konwerski, who called the event “a colossal success” in keeping with the theme of the night, said Midnight Breakfast was a chance to show students that GW supports their academic efforts. 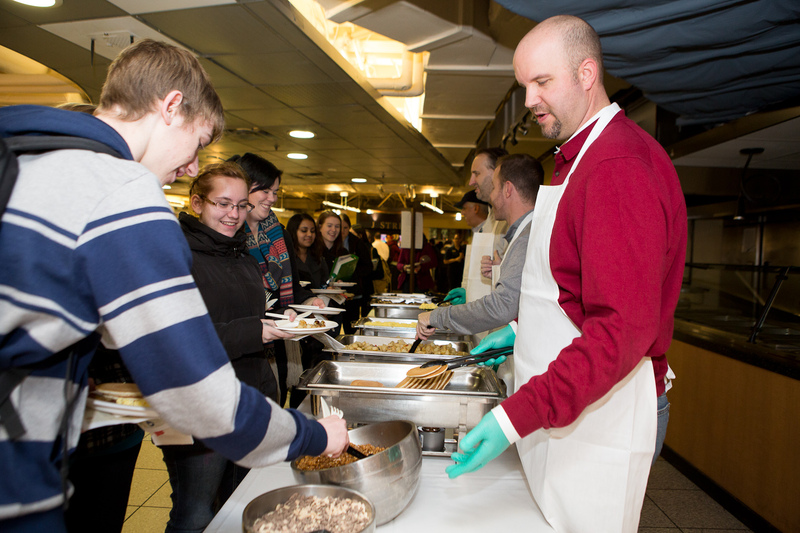 “We want our students to know that we care about their exam stress, and Midnight Breakfast is our chance to feed them some tasty treats as they get ready for the final push toward earning As in their classes,” Dr. Konwerski said. Freshman Kelsey Genuino and sophomore Renee Nguyen joined forces in Columbian Square to compete in a mystery cereal contest. Ms. Nugyen was blindfolded while Ms. Genuino gave her clues about what cereal she was eating—and although another team won, both students said it was one of the many fun activities that drew them to Midnight Breakfast. Other contests in Columbian Square included a T-Rex Race judged by Provost Lerman and a cereal-eating competition. Treats and activities weren’t just limited to dining areas. 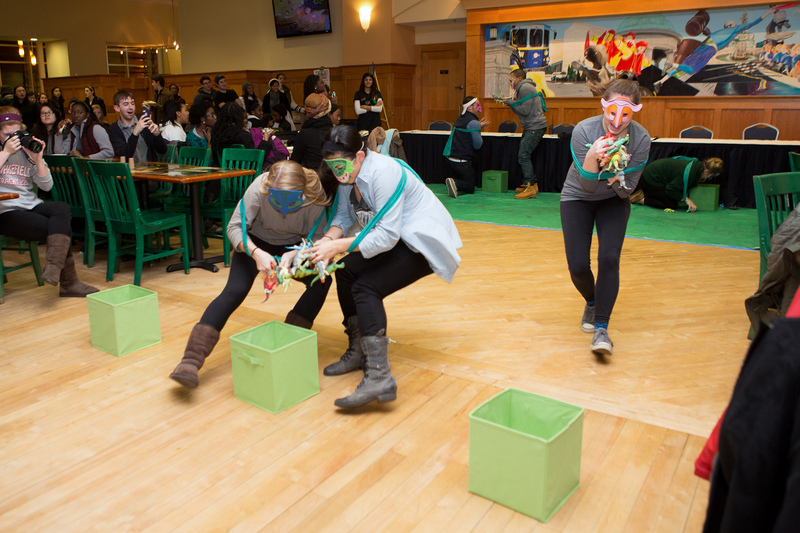 The third floor of the Marvin Center boasted game rooms featuring a “Dino Egg Run” and trivia competitions with GWise, acoustic performances organized by WRGW and a screening of “The Land Before Time” in the Amphitheatre. Freshmen Emily Davis, Justine Baird and Parth Taparia made cards for children spending the holidays in hospitals in one room. Ms. Davis, who had just turned in a major paper for her University Writing class, thought it would be a nice way to give back and get her mind off other pending final projects. She said she enjoyed the range of activities Midnight Breakfast offered. “I’m definitely impressed with how many activities are going on—this is a much larger production than I thought it was going to be. I thought they were just going to have some bagels for us,” she said. In the third floor lobby, the Student Association, the Residence Hall Association and Program Board set up tables to give students more information about their organizations. 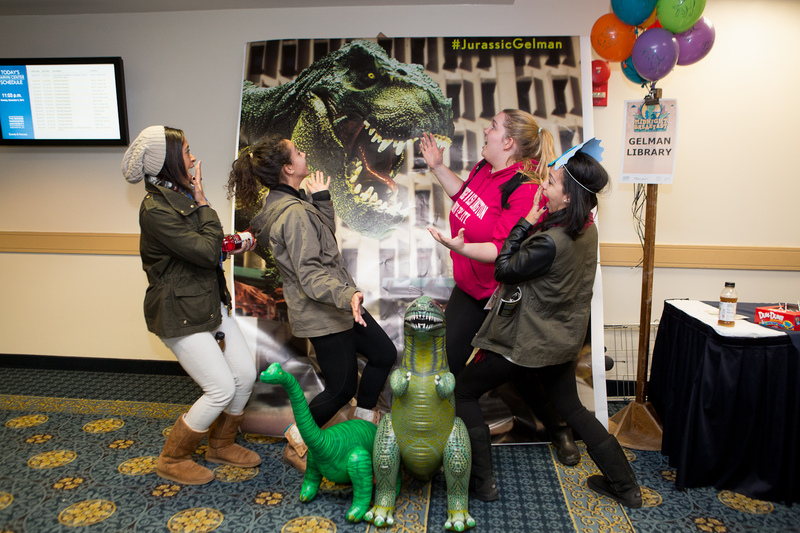 The Gelman Library staff also put together a dinosaur-themed photo booth. The Grand Ballroom offered more breakfast buffets and activities, like making fossils out of Play-Doh and a dino-toss with Colonial Ambassadors. Several students performed, too, including the 14th Grade Players and Capital Funk. Senior Mateo Garcia, a volunteer with Colonial Ambassadors, said he wanted to help at the event to support other students, particularly freshmen who may be new to the stresses of final exams. “By your last year, you definitely know what works and what study habits are better. I’ve been talking to some freshman, and they do seem stressed because it’s their first time taking extensive two-hour finals in college,” he said. He also explained he volunteered at Midnight Breakfast because the event brings the GW community together every year. “The whole campus is united—we’re all in the same boat as we deal with finals, and we all encourage one another to do well. 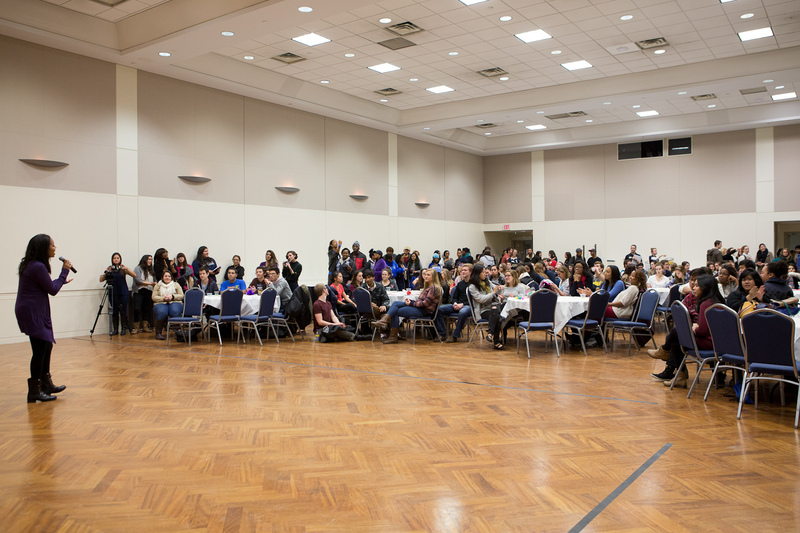 These events build a sense of camaraderie that’s palpable all over campus,” he said.